Prepare 9x9 glass baking dish with cooking spray. Preheat oven to 350 °F. Meanwhile, in a large skillet, brown ground beef. Drain. To browned beef, add salsa, taco sauce and chicken boullion cube. Mix well and simmer. 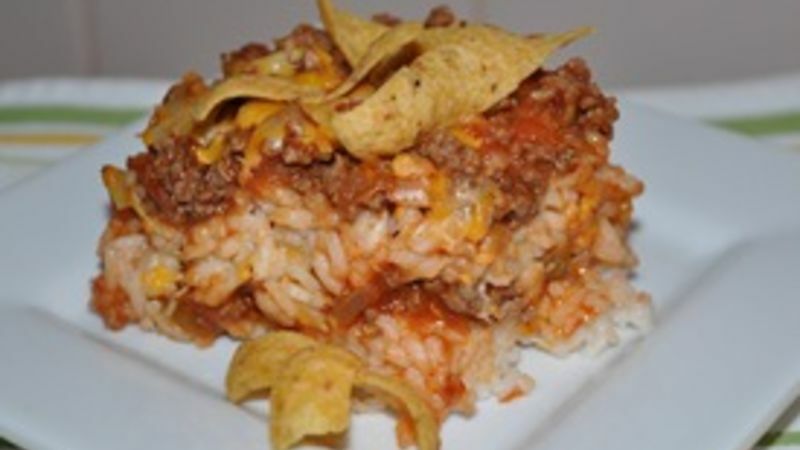 In baking dish, layer half of rice, half of beef mixture, and half of the shredded cheese. Repeat layers. Bake for 20-30 minutes until casserole is hot throughout and cheese is melted on top. Top with corn chips just before serving.